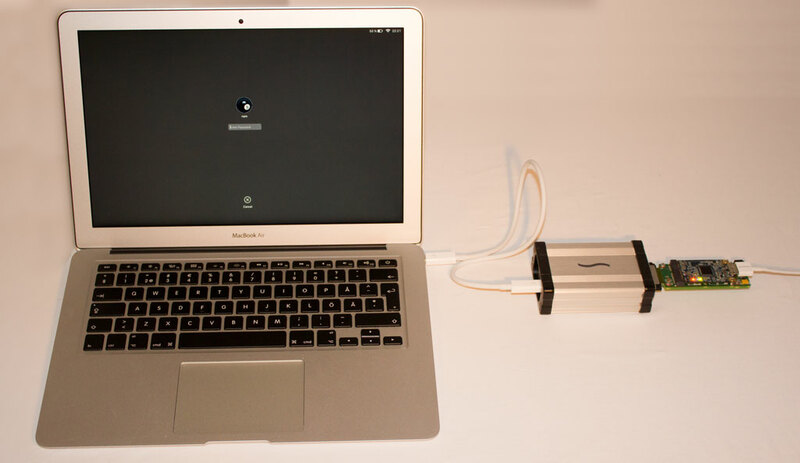 macOS FileVault2 let attackers with physical access retrieve the password in clear text by plugging in a $300 Thunderbolt device into a locked or sleeping mac. The password may be used to unlock the mac to access everything on it. To secure your mac just update it with the December 2016 patches. Anyone including, but not limited to, your colleagues, the police, the evil maid and the thief will have full access to your data as long as they can gain physical access - unless the mac is completely shut down. If the mac is sleeping it is still vulnerable. At the very core of this issue there are two separate issues. The first issue is that the mac does not protect itself against Direct Memory Access (DMA) attacks before macOS is started. EFI which is running at this early stage enables Thunderbolt allowing malicious devices to read and write memory. At this stage macOS is not yet started. macOS resides on the encrypted disk - which must be unlocked before it can be started. Once macOS is started it will enable DMA protections by default. The second issue is that the the FileVault password is stored in clear text in memory and that it's not automatically scrubbed from memory once the disk is unlocked. The password is put in multiple memory locations - which all seems to move around between reboots, but within a fixed memory range. This makes it easy to just plug in the DMA attack hardware and reboot the mac. Once the mac is rebooted the DMA protections that macOS previously enabled are dropped. The memory contents, including the password, is still there though. There is a time window of a few seconds before the memory containing the password is overwritten with new content. The PCILeech DMA attack hardware attached to a mac victim. After the PCILeech hardware is connected just run the mac_fvrecover command on the attacker computer. Retrieving the FileVault password with PCILeech. The correct password is DonaldDuck. The password, when entered, is stored in memory as unicode. Every 2nd byte will be zero if a password consisting only of ascii characters is used. Enter a "random" phrase, not naturally occurring in memory, at the password prompt. In this example the phrase eerrbbnn is used. In memory this is stored as 6500650072007200620062006e006e. Search for this using PCILeech and you'll notice that the phrase is stored in multiple memory locations as per the example below. Searching the mac memory for the test phrase eerrbbnn. After finding the memory locations it's possible to have a look at it. One might have to re-attach the attack device to the mac if the first read fails. If the locations found are checked out the password will be clearly visible. In addition to this other signatures that may be scanned for are also found, such as phd0 at the beginning of the memory page read. The phrase is clearly visible at the memory location. Can I try it out myself? Yes - Absolutely! Download PCILeech from Github and purchase the hardware. Password recovery have been tested and found to work on multiple macbooks and macbook airs (all with Thunderbolt 2). The attack is not tested on more recent macs with USB-C. Password recovery may fail if the user uses special (non ascii) characters in the password. In those cases a memory dump will be saved so that it can be manually searched for the password. Please note that trying this on other macs than your own might not be legal. End of July: Issue found. August 5th: PCILeech presented and released at DEF CON 24. (FileVault issue not mentioned). August 16th: Apple confirmed issue and asked to hold off disclosure. December 13th: Apple released macOS 10.12.2 which contains the security update. At least for some hardware - like my MacBook Air. The solution Apple decided upon and rolled out is a complete one. At least to the extent that I have been able to confirm. It is no longer possible to access memory prior to macOS boot. The mac is now one of the most secure platforms with regards to this specific attack vector. It is possible to break Kernel Address Space Layout Randomization (KASLR) on modern operating systems running on modern x86 CPU's. One possible way of doing this is to time certain operations when using the Transactional Synchronization Extensions (TSX) instruction set. TSX makes it possible for unprivileged user mode programs to detect whether certain virtual memory pages are mapped or unmapped in kernel mode. It is also possible to detect whether a kernel page is executable or not. It has been known since at least 2014 that timing attacks against KASLR, using TSX, is possible. This was discussed by Rafal Wojtczuk from Bromium Labs in the blog post TSX improves timing attacks against KASLR. The technique was popularized and presented at Black Hat US-16 by Yeongjin, Sangho, and Taesoo from Georgia Institute of Technology. Their presentation and white paper is found on the Black Hat site. Example code for Linux was published on Github after the talk. Since no example code was published for Windows I decided to look into this to see if I could make the technique work reliably on Windows as well. The result is presented in this blog post and the resulting code is found my my Github as kaslrfinder. I used my NUC to develop and test kaslrfinder. It is the only system capable of TSX I have access to. It also have plenty of memory and an USB-C/Thunderbolt3 port. 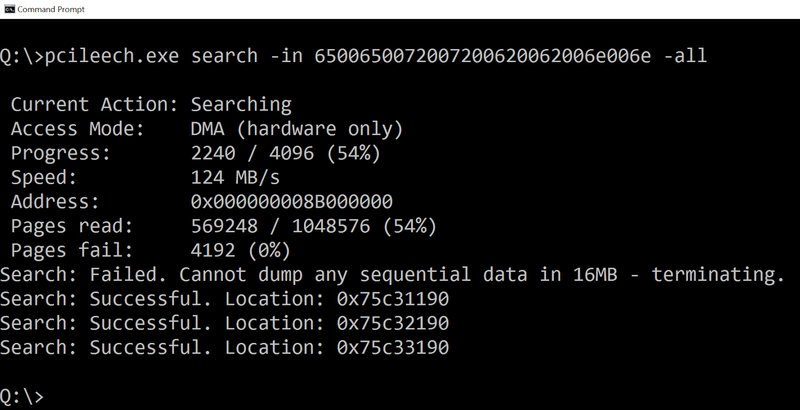 This made development easy since I could use PCILeech to query the kernel for addresses over Direct Memory Access (DMA). No Virtualization Based Security (VBS). The NUC Skull Canyon test system. 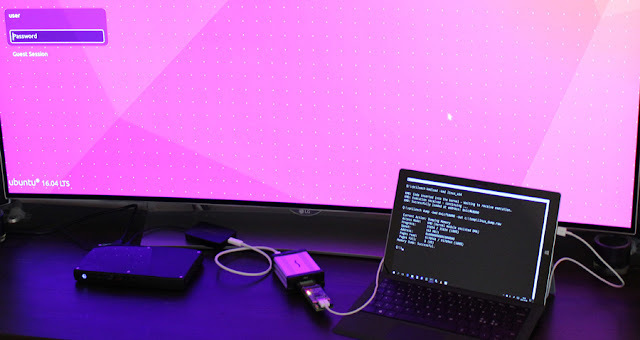 PCILeech connected via Apple USB-C to Thunderbolt2 adapter. The Windows 10 kernel is loaded into consecutive large (2MB) pages in the range 0xFFFFF80000000000-0xFFFFF803FFFFFFFF. The location is randomized. In total there are 13 bits of entropy, or 8192 possible locations. The Windows 10 kernel is further randomized within the large (2MB) pages. The table below contains ten (10) randomly sampled ntoskrnl.exe base addresses. The addresses are shown both in hexadecimal and binary. The columns in the binary denotes changes in paging levels. The table makes it clear that while the kernel is mapped into large pages its base address is randomized down to 4kB. Windows randomizes the kernel base address within the large pages. The table indicates, in the 5th binary column, that the kernel is randomized between 0-1MB within the large pages. Since the TSX attack technique is dependent on detecting whether a page is executable or not it cannot be used to further detect randomization within the large pages. KASLR entropy is however effectively reduced from 21 bits (13+8) to 8 bits/256 possibilities. The kernel modules and drivers in Windows 10 version 1607 have been observed to load into standard (4kB) pages in the range 0xFFFFF80000000000-0xFFFFF80FFFFFFFFF. In previous Windows 10 versions the modules have been observed to load into the same more limited range as the kernel. The modules are randomized to an even 16kB (0x10000) boundary. This holds true for most, but not all, modules. The notable exceptions are win32k.sys and related modules which may be randomized outside this area. Special modules like hal.dll and ci.dll have been observed to load at 4kB, 0x1000, boundaries. At the very core of the issue is the XBEGIN and XEND TSX instructions first introduced in some Haswell CPU's. Everything between XBEGIN and XEND is guaranteed to execute as an atomic operation. If some other thread interferes with memory while executing in an XBEGIN-XEND TSX block the TSX operation is guranteed to fail and any changes are rolled back and will become void. In fact if anything happens inside the XBEGIN-XEND block the operation will fail and execution will continue at the address of xabort specified in the XBEGIN op. This includes page faults and various types of access violations. Reading memory from a "forbidden" mapped kernel compared to an unmapped page. Writing memory to a "forbidden" writable kernel page compared to an unmapped or read-only page. Executing in a "forbidden" mapped executable kernel page compared a non executable or unmapped kernel page. The addresses we wish to test must also be mapped into the page table of the current process. Windows, Linux and macOS all do this for performance reasons. It shall however be noted that Windows is not mapping hypervisor memory into the process page table. As a result of this it is not possible to disclose hypervisor memory addresses with this technique. In the assembly code listing below only XBEGIN is shown. XEND is not required since the JMP rsi is always guaranteed to fail. 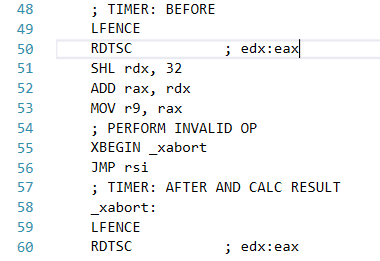 Assembly listing the XBEGIN op, the JMP to the kernel address and the timing before and after measurements. How do I try it out? Download kaslrfinder from Github.A CPU with the TSX instruction set is required. Kaslrfinder have only been tested on Skylake CPU's, but nothing indicates it shouldn't work on Kaby Lake CPU's and even on some Haswells if they have TSX enabled. Please note that kaslrfinder isn't 100% stable. It may at times fail to uncover the address of the kernel or the driver that is searched for. Timing measurement algorithms may be tweaked some more to improve accuracy in the future. kaslrfinder locates the address of tcpip.sys in Windows 10 1607/14393 patched with the November 2016 patches. What can be done to mitigate? First please note that Kernel Address Space Randomization (KASLR) is an additional protection mechanism designed to make some kernel security issues harder to exploit. Finding out about kernel addresses won't do anything bad unless another security issue exists as well. kaslrfinder is not a malicious program. Please also note that it is not possible to use this technique to find out the address of the actual kernel itself for reasons discussed above. What can users do to mitigate? Answer: nothing. What can operating system vendors do? Probably several things, but finding a solution without any downsides will be hard. The best thing for now might actually be to do nothing. I plan to follow up on this in the RS2 Windows insider releases. It will be interesting to see how this will develop in the future. Will TSX be kept as-is?, will constant timing be guaranteed? or will the instruction behavior change in future CPU's? This should no longer work if post-meltdown attack patches have been applied to the operating system. I just got an Intel NUC Skull Canyon that has an USB-C port capable of Thunderbolt 3. Thunderbolt is interesting since it's able to carry PCI Express which is Direct Memory Access (DMA) capable. I have previously demonstrated how it is possible to DMA-attack macs over Thunderbolt 2 in my DEF CON talk "Direct Memory Attack the Kernel". To attack my MacBook Air in the DEF CON demo I used a Sonnet Echo ExpressCard Thunderbolt 2 to ExpressCard adapter together with a PCILeech ExpressCard. I also got a Thunderbolt 3 to Thunderbolt 2 adapter from Startech and I wanted to try it on the NUC to see if it's possible to use it for DMA attacks, or if Thunderbolt has been secured. 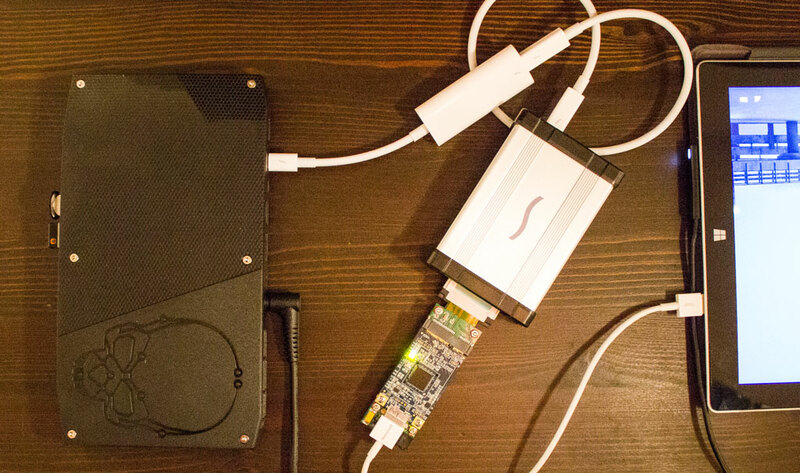 The setup looks like this: NUC -> Startech TB3 to TB2 adapter -> Sonnet TB2 to ExpressCard adapter -> PCILeech ExpressCard. There exists a BIOS setting for the Thunderbolt Security Level. The default setting is Unique ID. The other possible security levels are Legacy Mode, One time saved Key and DP++ only. The Legacy Mode is of special interest when it comes to DMA attacking. Thunderbolt Security Level in BIOS - Unique ID is the default. It was not possible to access memory before the OS started - when the computer was still in BIOS/UEFI mode. The PCILeech device wasn't initialized at all. It was not possible to access memory in Linux. Ubuntu detected that the Sonnet Echo ExpressCard adapter was connected but there was a lot of error messages; probably due to lack of driver support. No driver was installed in this test. Error messages when connecting the Sonnet Echo ExpressCard adapter to the Startech adapter. It was not possible to access memory straight out of the box in Windows 10 with the Unique ID Thunderbolt Security Mode. Windows 10 first didn't react at all to the Thunderbolt devices connected. The devices were then disconnected and the proper Thunderbolt drivers from Intel was installed. When the Startech Thunderbolt 3 to Thunderbolt 2 adapter was connected nothing happened at all. 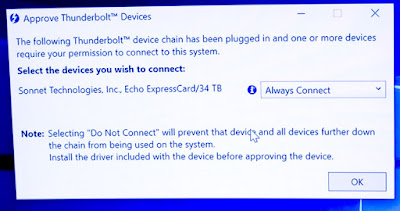 When the Sonnet Echo ExpressCard Thunderbolt 2 to ExpressCard adapter was connected Windows popped up a prompt asking to approve the adapter. Administrative privileges was required to approve the Sonnet Thunderbolt 2 to ExpressCard adapter. It seems like the Thunderbolt 3 to Thunderbolt 2 adapter from Startech is transparent in this setup - while the Sonnet adapter is not. The Sonnet adapter was approved by the logged on administrator. Approve Thunderbolt Devices administrative box. After the Sonnect Echo ExpressCard device was approved the PCILeech device was inserted into the Sonnet adapter. Windows did not react at all. The PCILeech device was working. It seems like if the Thunderbolt Security Mode set to Unique ID and do have a Sonnet adapter approved you are at risk for DMA attacks even though the PCILeech may never have been connected to the system previously. On the other hand if you are just running Windows 10 and never connected a PCI Express adapter, like the Sonnet Echo ExpressCard, you should be secure. Just like previously it was not possible to access memory before the OS started - when the computer was still in BIOS/UEFI mode. The PCILeech device wasn't initialized at all. Dumping memory over Thunderbolt 3 is working perfectly on a locked Ubuntu 16.04 LTS provided that the Thunderbolt Security Level is set to Legacy Mode in the BIOS settings. If Thunderbolt security is set to Legacy Mode just plug in the PCILeech device via the adapters into the Thunderbolt 3 port in the NUC and start dumping. It's as easy as that. No drivers are required on the target system. 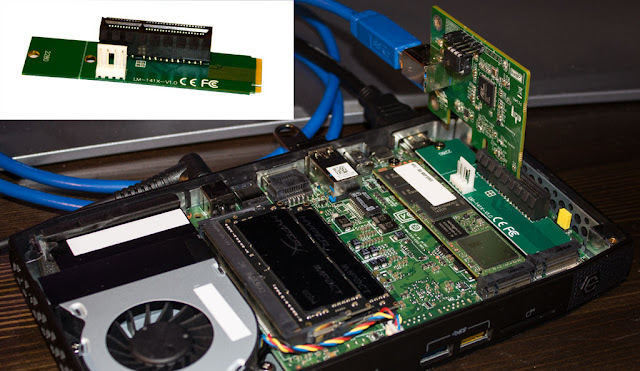 In the example below the adapters and the PCILeech device was connected to the Linux system for the very first time. 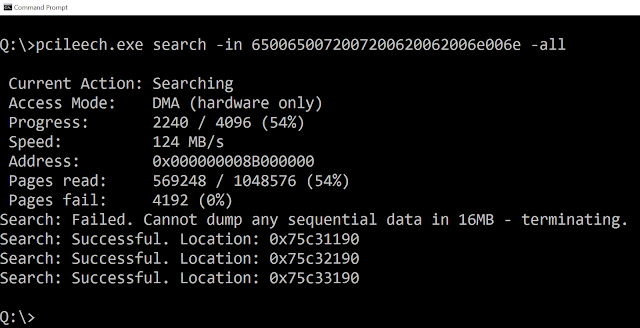 Dumping 32GB memory over USB-C/Thunderbolt 3 on Ubuntu 16.04 LTS. 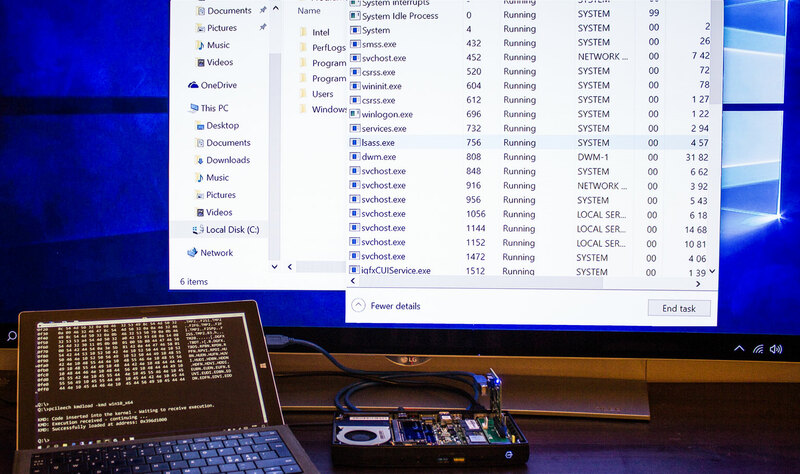 Accessing the memory of a Windows 10 system also works if the Thunderbolt Security Level is set to Legacy Mode. It is possible to access the memory of a Windows 10 system by just plugging in the adapters and the PCILeech device - no drivers are required on the target system - it just works! There was no need to install the Intel Thunderbolt drivers in order to access the memory. 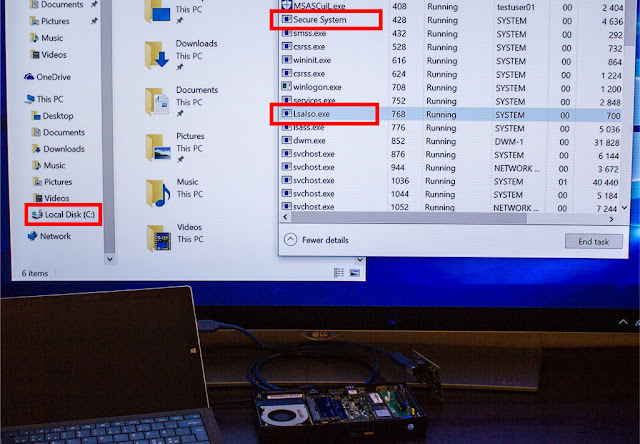 Windows 10 system shell spawned over Thunderbolt 3. The setup was incompatible with the other two remaining Thunderbolt Security Levels. Not all USB-C connectors support Thunderbolt 3. 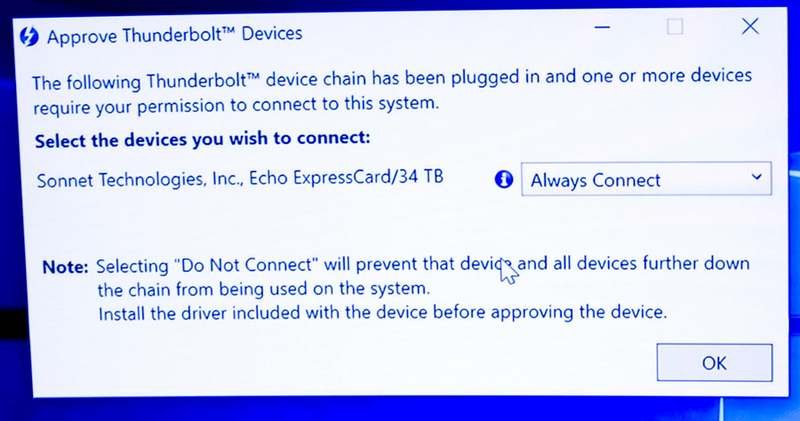 The default Thunderbolt security settings are secure - unless you approve a Thunderbolt to PCI Express adapter like the Sonnet Echo ExpressCard. Also set a BIOS password to prevent an attacker to change into Legacy Mode without you noticing.